When it comes to building your nest egg, how much is enough? Here’s what you should know about saving at different stages of your life. Whether you have already started saving or are about to begin, one thing’s for sure: to keep pace with the escalating cost of living, individuals must keep monitoring their savings pace and fine-tune that habit. The key to a successful retirement lies in three areas: the rate of your savings, the returns they generate, and the cost of living. Of the three, the latter two are market dependent and fluctuate according to the economic environment. These are the two areas where none of us has a say. But one area where you do have a firm handle on is your savings rate. A comfortable retired life, these days, hinges on the savings rate as the market situation is constantly changing. It’s the only way you can determine whether you will have enough to last your lifetime. Consider this, at an inflation rate of 6 per cent, a 30-year-old executive requires Rs 13,039 per month to fund a comfortable retirement. But if we assume an inflation rate of 8 per cent, then individuals have to increase their savings amount by nearly 50 per cent to Rs 19,071. The fast pace of life for today’s middle-aged executives leaves little time for retirement planning. Not many are covered by the government-sponsored pension schemes. It’s not that difficult to have a comfortable retired life. It all boils down to how you begin your journey. It depends on factors like the standard of living one wants to maintain after retirement, expenses one will incur then, medical costs, the effect of inflation and age of your retirement. Even if you have begun late, you might be able to manage your retirement comfortably. You need to factor in inflation as well. If your current expenditure is Rs 1 lakh annually, then at an inflation rate of 5 per cent, your expenditure at the time of retirement will increase to over Rs 4.35 lakh per annum to maintain your current standard of living. A higher inflation rate will result in increased post-retirement expenditure. So, if one plans to save just Rs 1 lakh for retirement, he may fall short of the ideal target amount. There’s no denying the fact that people who start late have to save more. As our chart demonstrates, those who start saving in their fifties need to save almost five times the amount per month than those who start in their early thirties. In fact, you also have to factor in the different stages of your life. For instance, people who are married with children have to save more than those who are single. When it comes to investing your savings, experts say you should keep it simple. Says Surya Bhatia, Asset Managers Private Wealth Management: “Divide your investments in to two asset classes—debt and equity. Within these two asset classes, you can earmark the time horizons of when you want the money to flow in.” Factor in the average returns of both these asset classes to arrive at a target return. How much it costs to spend on vices? Many of us are aware of the cost of daily living. Few of us have, perhaps, done the math on some of our favourite vices: alcohol and cigarettes. Some of us may have even included these costs in our daily budgets. But when you consider the cost of these habits, the amount you spend on these delights could instead help you reduce your retirement corpus considerably. 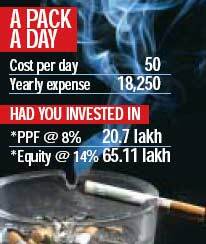 Consider this, a packet of cigarettes cost approximately Rs 50, which amounts to around Rs 18,250 per annum. If the same is invested in the Public Provident Fund account for 30 years at an interest rate of 8 per cent, it tantamounts to burning Rs 20.7 lakh up in smoke. 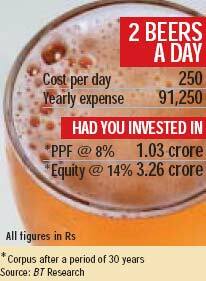 If you have two beers a day, your bar bill amounts to approximately Rs 250, plus some tips, which amounts to Rs 91,250 per annum. The amount can easily finance an annual weekly holiday for two in South-East Asia. Yet, if you stash away that amount for your retirement in the safer tax-free PPF at 8 per cent per annum, your corpus can easily increase by over Rs 1 crore. Given the investment options available, the key then is to decide what proportion of your income you should set aside to maintain your present lifestyle after retirement. Broadly, investors need to save a certain percentage of their annual income and invest in instruments that have the potential to give the desired results over different time horizons. For different age groups, the rules of the game change. The middle overs: Age 41 to 50. Around 25 to 35 per cent of the annual income should be saved. As the time horizon to retirement is still long enough, equity and equity funds should continue to be a crucial part of the portfolio—around 50 per cent or more. The balance can be invested in tax-efficient instruments providing steady returns. You can fine-tune your savings habit to suit your risk profile and style. Direct your savings to an investment plan. And don’t shy away from equities. Says Ghatlia: “What is ideally required in order to create the nest egg is an investment strategy that focusses on building a large corpus. This is possible only when the asset allocation and the investment plan is overweight towards equity-related instruments.” In fact, a 2 per cent difference in returns per annum in your investments can alter the corpus that will vest on retirement by over 40 per cent over a horizon of around 20 years.